The Sea Change is definitely a place to celebrate a special occasion. From its stunning and dramatic interior design to the friendly staff, this is a great place if you want excellence in seafood. 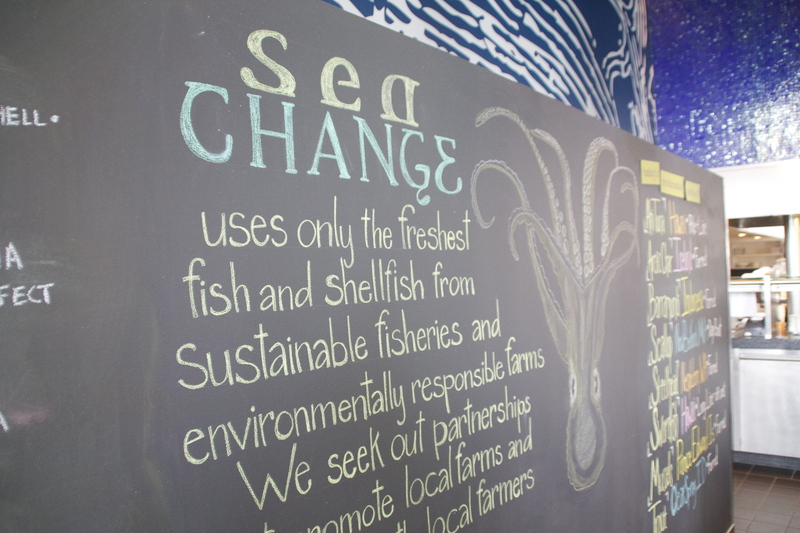 Sea Change is a sustainable seafood restaurant and raw bar with their menu developed by 2009 James Beard Award-winning chef, Tim McKee. Sourcing their products from fisheries that use environmentally friendly methods or gathering and farming seafood, you can rest assured that you are receiving a quality meal. Additionally, they offer plenty of non-fish entrees so everyone is welcome. You’ll be entertained in any place that you are seated. From their large windows that allow you to view the Mississippi to their open kitchen, there’s plenty to look at if the conversation turns slow. Let’s hope you have plenty to talk about, may I suggest the cuisine, but if you don’t, comment on the architecture. Sea Change has had coverage from the New York Times highlighting Chef McKee, the atmosphere and, of course, their entrees! To find more attention they’ve received from the media, please return to their website. My fiance hit the nail on the head with this one. He took me here for a surprise Valentines Day date (yes, I know it took me until May to write about it). I would advise taking your date here and then check out one of the many Guthrie performances. Really, this is a wonderful date. Now, I really do apologize or the lack of pictures for this post. I didn’t feel it was appropriate to snap a picture with my iPhone. I would feel slightly…okay, a lot less classy if I did that in this place. For pictures, please check out their Facebook page in the link above. Now, on to what this post is really about…the dinner! We went all out on this one. We went for dinner and decided to order cocktails, an appetizer, entree, and finish with a dessert. The cocktails of choice were “The Sun Also Rises” (this was totally mine) and “Aurora Borealis”. Creative names for the perfectly mixed drink. Our appetizers were soon to follow. We ordered the grilled octopus completed with salsa verde, spanish peppers, and pimenton. With that smoky flavor so characteristic of grilling, this was a hit for me. With the sauces, it was just what we needed to get our appetites going! Tony decided to go with the grilled ribeye. I swear, this place makes art with they way they present their plates. His entree was arranged in small stacks that formed a circle around the outer rim of the plate and the middle contained the sauces. He had no complaints. Stating that “it’s so tender” and that “I wish I had more” pretty much summed up this dish. What a happy man. I went with a seafood option. Mine was the Brandade. The Brandade included ravioli pillows stuffed with freshwater fish. The ravioli was topped with a sunny-side up egg yolk, bagna cauda, and tomato. To this day, I will still remember it as one of my top seafood dishes I’ve ever had. I absolutely loved the addition of the egg yolk in this. It worked in combination with the bagna cauda as a dipping sauce for the ravioli. The ravioli itself was prepared beautifully too. There’s nothing worse than over/undercooked pasta, but Sea Change wouldn’t ever let that happen. My fiance even loved this one and he’s not that much of a seafood kind of guy. We both decided to go with the Lime Pudding Cake. Trust me on this one, save the room in your stomachs because this is well worth it. Life everything else they serve, the presentation was almost too good to eat. I didn’t want to ruin it! This would dessert reminded me of key lime pie. It was presented with three circular, sweet sponge cakes topped with a dollop of lime sauce and pistachio financier (google it). Coconut cream was also drizzled over the serving plate. To me, this dish alone brought the feeling of summer to my cold, bitter winter. Again, we spent a great deal of time enjoying this one. It’s become a favorite of ours whenever we pay a visit. Overall, I highly recommend this restaurant to anyone in the Twin Cities Metro area. You can see the level of detail in everything they serve. The presentation and cleanliness is always apparent. I would like to note, their amazing wait staff. They are very friendly and are focused on providing you with an amazing experience. Plus, they have an extensive knowledge of their menu and offer excellent suggestions for those of us who are unfamiliar with items on their menu. Whew, talk about a wide range of deliciousness!